My aim is to £250,000 for Prostate Cancer. BUT... I need to get to the start line first. 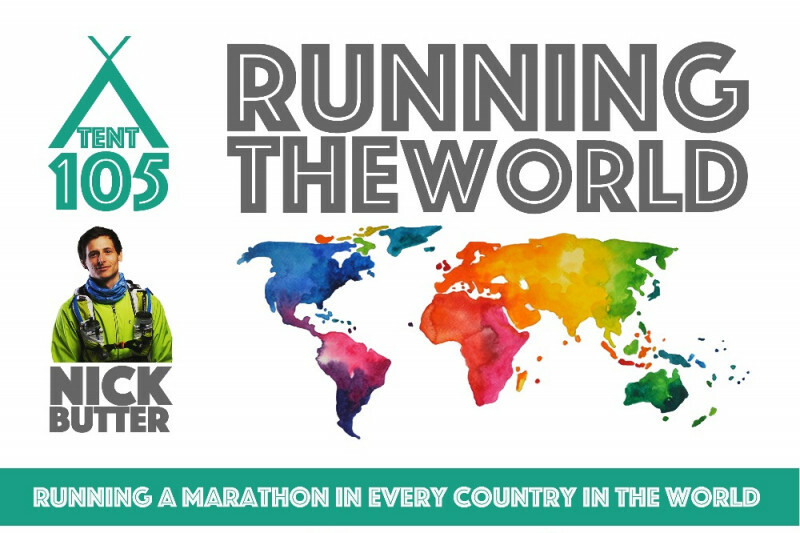 On January 6th 2018, Nick Butter will be embarking on a world record attempt to run a marathon in every country in the world. There are 196 official countries in the world. Starting in London, he will cover 5130 miles, running 26.2 miles in each country. In many countries he will encounter hostile environments such as the war zones, the Sahara Desert, areas of political instability and the extreme cold of Antarctica. The trip will naturally cover all 7 continents and every one of the 196 countries on earth. Nick will be living simply, camping wild in areas it is safe to do so, cooking on a stove and carrying all equipment. He is pre arranging families in each country to stay with where possible. Read further to understand why this is important to Nick. What: Nick Butter is travelling to every country in the world. He will run a marathon in every one of the 196 official counties and set a world record in the process. Starting in London he will spend on average 2.5 days in each country. There are many countries where only half a day is required or where it is particularly dangerous. The trip will take 550 days. With approximately 60 days of contingency to allow for unexpected delays and sickness. Closer to the date Nick will have the flexibility to spend longer in countries where necessary. Leaving the world better than I found it; that’s my personal mission. By exploring, trying new things, pushing myself beyond the comfort zone and never sitting back and saying I’ve finished, I’ll hopefully be able to inspire young minds, old minds; any minds in fact. I will inspire, motivate and deliver the message that we can all do our bit to make our world a better place. My sport is running, so this is how I will do it. Tomorrow is a maybe, today is a privilege, so let’s go make the most of today. I strive to do good, be good, and succeed. Many people say running is an individual sport, but actually those of you that run, I’m sure you know, the running community is the biggest team sport that exists. This trip will create a community throughout the world. Link all the non runners with the elite athletes, provide an opportunity for achievement and give access to sport which many overweight unhealthy kids and adults don’t feel they can be a part of. I aim to be living in people’s homes all over the world and experience their culture. Through the momentum of the trip it will draw people from throughout the globe to enjoy running together: be it online, through social media or in person. In April 2016 I took part in one of the greatest ultra races on the planet. The Marathon des Sables. 7 days of gruelling heat running through the Sahara Desert. I met an exceptional man. His name is Kevin, Kevla to us. He’s in his 50’s and has about a year to live. He has terminal prostate cancer and lives relying on dozens of drugs and monthly tests. He will not have the life most of us take for granted. Before Kev I had never come across Prostate Cancer in such an intimate way. He amazed me. His attitude to life was pure, knowing that time is limited changed everything. This is what I aspire to appreciate, hence why leaving a legacy is so important. It is for him that I aim to raise £250,000 for the charity Prostate Cancer UK. Through coverage, publicity and an exceptional team of wonderful supporters, I believe this is well within my grasp. My personal goals are not just about running. I have a love of photography. Photos capture experiences, people, and culture; it’s a great way to highlight the story of running the world. To travel to every corner of the globe and experience true diversity of race, wealth, politics and society will produce a remarkable photo journal. This will be the icing on the cake of a trip of a lifetime. This trip houses all of what I hope to achieve, I love to explore, to run, to take photos, to meet wonderful people and to begin to leave a positive a mark on the planet by creating a global running community. Who: Nick will be travelling solo for the majority of the trip with friends and family joining him where possible. As the trip gains momentum there will no doubt be more followers looking to join him in various locations around the world. He will also be running with the families he stays with, and their connections. Nick has a network of people supporting his trip. By the time the trip starts this will have no doubt grown somewhat. The immediate team include PR agents, event managers, and emergency support. There’s a long list of those who will be helping to make the event possible. This list will be published nearer the time. It's getting very real now. Thank you for your donations. Keep them coming. Please share far and wide. You will receive a signed copy of the large format photo journal which will be produced and published once the trip is complete. The book will include large format high resolution photos of culture, people, the races, travel, the emotional highs and lows and the variety of incredible key places all over the world. Commentary will accompany the photos with descriptions, anecdotes, and short details of the situation and why the photo is so special. Immediate announcement of sponsorship via his website to over 130,000 visitors. Regular bulletins sent to all subscribers through Nick’s blog and newsletters. Nick writes for all sorts of magazine, running and adventure publications. You will be mentioned including links where possible. A credit and thanks to all outcomes of the trip, this includes, documentary, large format photo book, written journal and all other subsequent outcomes. It is a great cause and I am currently undergoing tests for prostate/bladder issues! Amazing and inspirational. A great cause too. Thanks to you I ran my first half marathon just short of age 55! I love the updates - brilliant to see your challenges and how you bring people together with such positivity. I donated because my son Andy is currently in Kiev with his close friend Nick hoping to run five marathons with him. This is his fourth trip to join Nick so far and support him on his epic challenge. Well done Andy, please keep Nick away from dogs! Half way Nick, on the home straight now, what an amazing achievement. I met your parents at a Cranborne village "do". Hope to meet you on your return. John (and Barbara). Think Pink Luxembourg were delighted to have had the opportunity to meet and run with you Nick for such a worthy cause. I find Nick Butter to be an inspirational man and I want him to manifest my support.